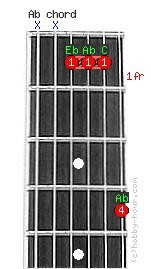 3 Ab 1 1st fretfr. 1 Ab 4 4th fretfr. Chord Ab notes: Eb, Ab, C and Ab. You must leave out the 6th and 5th strings. Ab(G#) major chord's alternative names: AbM, Abmaj, La bemol major, Ab dur, G#M, G#maj.